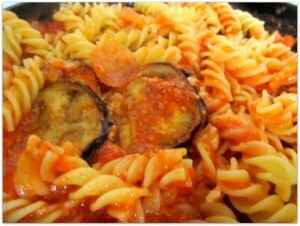 Pasta with red sauce and eggplant! I know it sounds weird, but trust me it tastes great. I am going to describe how to prepare each elements of this dish. While preparing the dish feel free to multi-task, like while the pasta is cooking starts frying the eggplant chips. This will definitely speed up the cooking process. 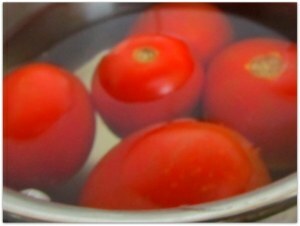 To cook the pasta, boil some water in a sauce-pan with a spoonful of salt. Adding salt to the water is very important, otherwise the pasta will taste very bland. When the water comes to a rolling boil, add the pasta. Cook for 8 to 10 mins (or for whatever time mentioned in the pack) till the pasta is cooked. If you can bite into a piece then you will know it is cooked (al Dente) . 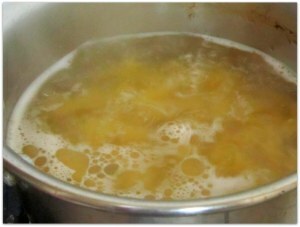 If the pasta is cooked for longer than intended, then they become mushy and sticky. We don’t want that. 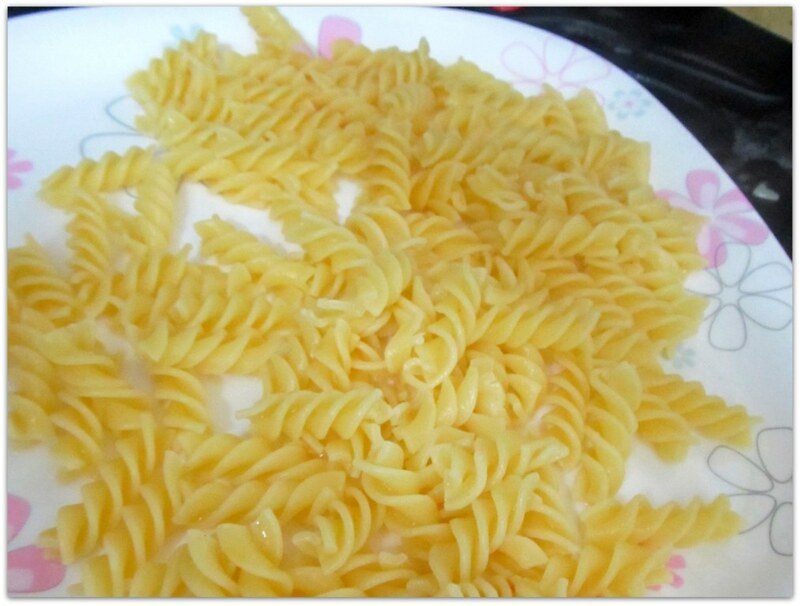 When the pasta is cooked to your satisfaction, drain the water from the cooked pasta and spread them on a plate. Sprinkle some olive oil on top of it. The oil will prevent the pasta from sticking. Cut the eggplants in round disks and marinate with some salt and pepper. Keep the marinated eggplant pieces aside for 5 minutes. During this time the eggplants will release water. This step is necessary, since we don’t want the eggplant to release water while cooking. We want crispy eggplant chips as our end product. Water will make them soggy. 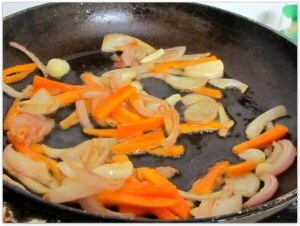 Take a frying pan and heat up 2 tbs of vegetable oil. 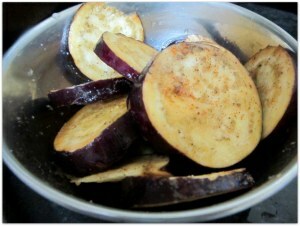 Eggplants take a lot of oil to fry. When the oil is hot, place the pieces one by one and fry till both the sides become crisp. Be very careful, eggplants splatter oil. 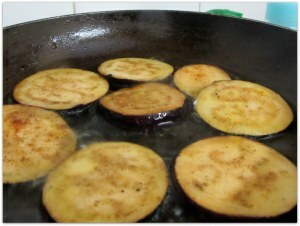 When done, the excess oil can be soaked from the eggplant chips on a kitchen towel. In a saucepan boil some water. When the water starts to bubble add the tomatoes and cook them still the skins starts to crack. 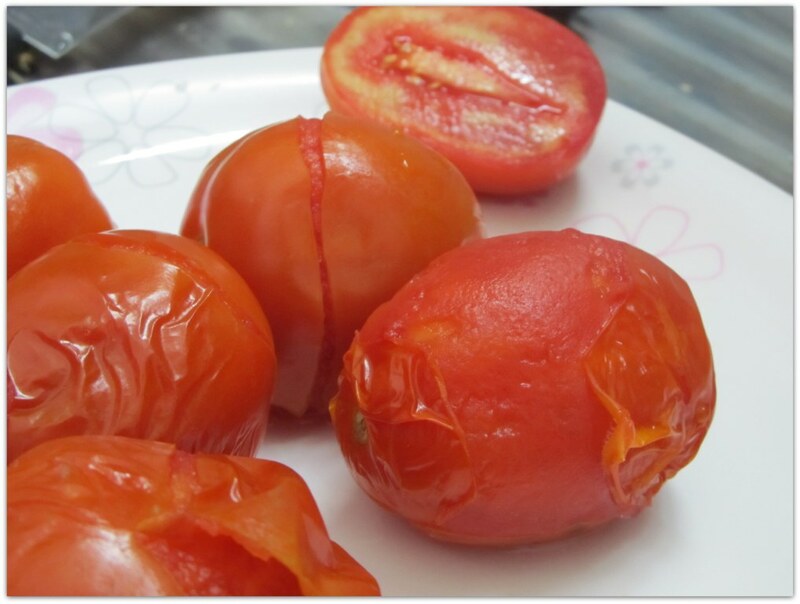 Take the tomatoes off the heat and keep them aside to cool. If you in a hurry, keep the tomatoes under cool running water. This will speed up the cooling process. 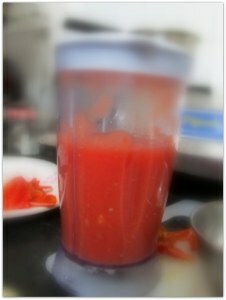 When the tomatoes are cool enough to touch, gently peel all the skins and blend them in a mixer-grinder till you get a smooth red sauce. Cut one onion and two garlic cloves. Dice the carrot into long thin pieces. 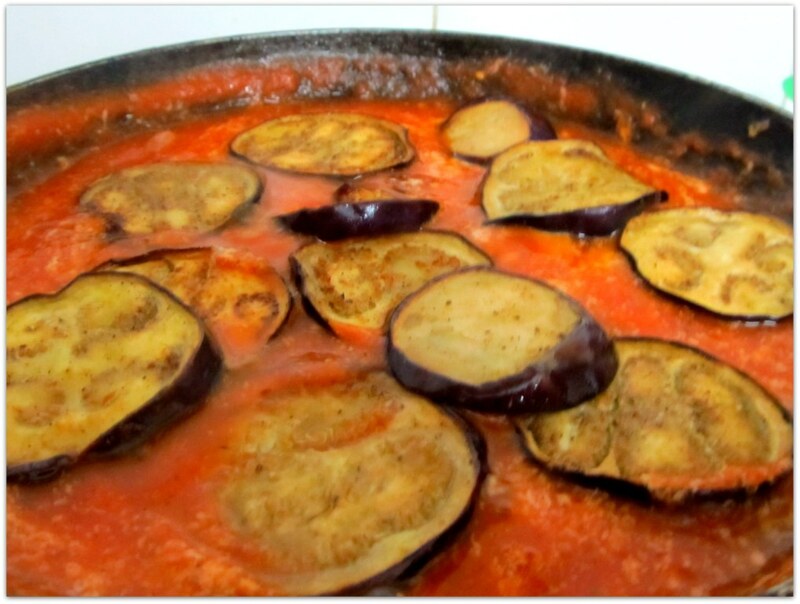 In a frying pan heat some oil, you can use the left-over oil after cooking eggplant. 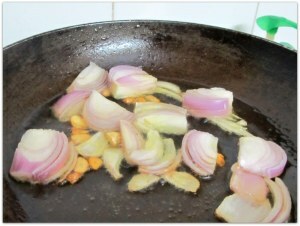 Add the garlic pieces and fry till they starts to become brown. Add the onion and fry till they become translucent. 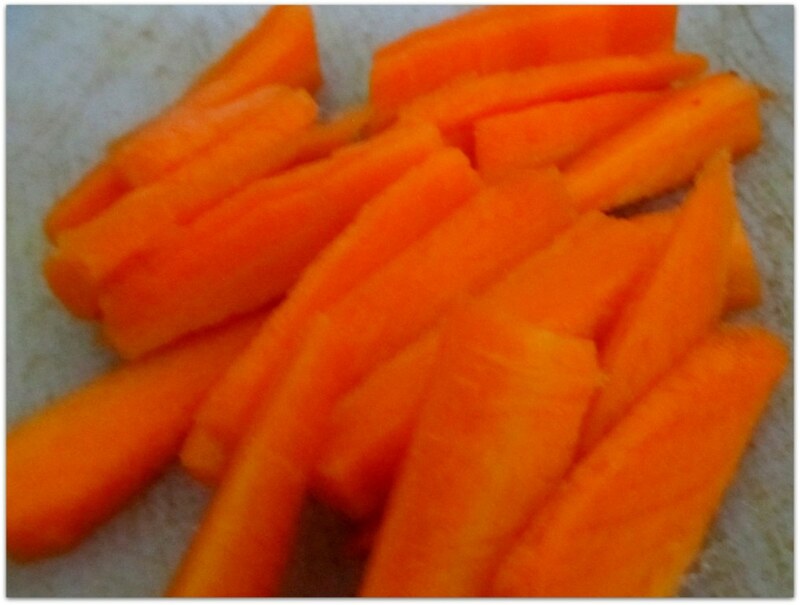 Add the carrot pieces and saute for 2 to 3 minutes. 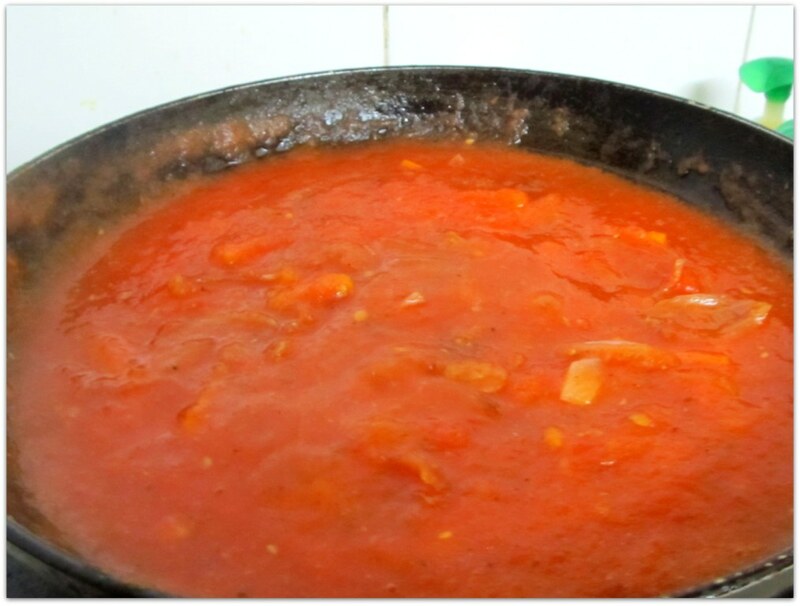 Now add the tomato puree in the pan. Add salt, pepper and mixed herbs and simmer for 5 minutes. Now add two slices of processed cheese in the sauce. They will melt immediately. Mix them with a spoon or ladle. When the sauce is done add the eggplant chips and simmer for another minute. 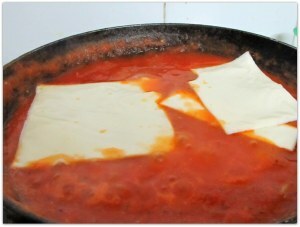 Add the pasta in the sauce and mix well. 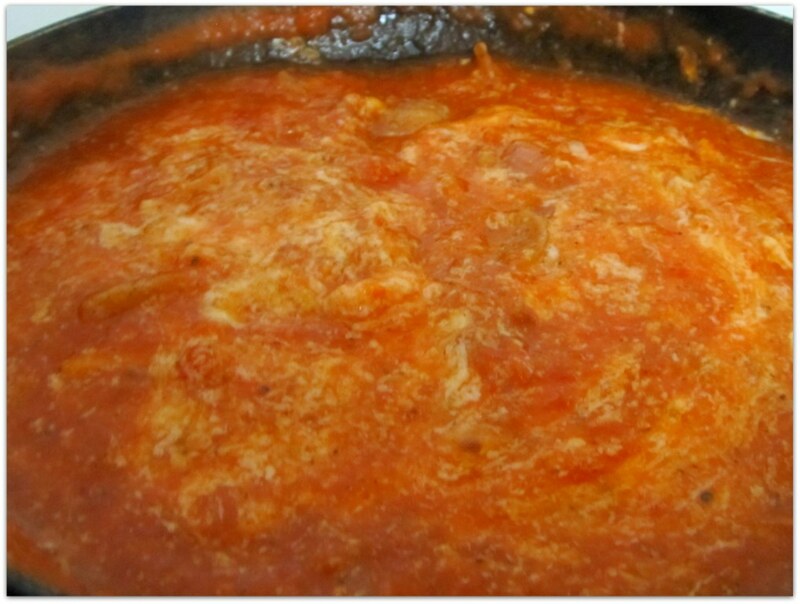 Your pasta with red sauce and eggplant is ready to serve. 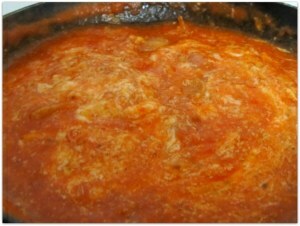 Pasta with red sauce and eggplant is ready to serve.